There's independent owned and internationally inspired options a plenty throughout Leith and Broughton Street. Choose from French classics, Spanish tapas, Mexican tacos, Chinese dim sum, Indian curries or Turkish breakfasts fit for a sultan. While many Mexican offerings in Edinburgh focus on traditional flavour combinations, a trip to Bodega breaks the mould. The soft taco selection reveals the international and street food influences which place this establishment ahead of the pack. There's globetrotting flavours such as Japanese-inspired avocado tempura with wasabi mayo. Each taco unveils a new adventure but remains perfectly cooked and balanced. This Leith Walk taqueria is a festive, colourful yet snug space, with cheery service and a BYOB policy. True to its name, Bijou is a real, pocket-sized gem among the city's independent restaurants. The décor evokes a backstreet Parisian bistro, especially if there's something French and jazzy on the stereo. The wee menu reflects the wee space and features handmade burgers; pasta such as wild mushroom gnocchi; and hot-smoked salmon fishcakes. There is also an ever-changing mix of specials. Add in a talented chef and some well-chosen wines from Great Grog, and it's a winning combination. This much-revered bistro in Broughton Street is home to true French cooking, produced with obvious passion and soul. The menu serves all the expected Gallic classics with a slight Caledonian slant. So you get Isle of Lewis mussels served 'Cullen skink style' with smoked haddock, or a duo of Borders roe deer and pigeon. Provenance is writ large in l'Escargot and you're as likely to find North Ronaldsay mutton on the menu as you are confit duck and French cheese. Laid out over two wood-lined rooms in the ground floor of a 17th-century watchtower on Leith waterfront, this restaurant has been producing reliably good fish and seafood since 1991. The Fishers Favourites menu features time-honoured, tried-and-tested crowd-pleasers such as oysters and mussels, fish soup and fishcakes, seafood platters and steaks, while veggie diners have their own menu. With an extensive wine list and a good value set lunch deal old lady Fisher offers up something to satisfy everyone. Khushi's has become an Edinburgh institution. The menu features old favourites like jalfrezi alongside more unusual offerings. Prawn kolhapuri delivers succulent marinated king prawns coated in a light crispy batter. Home-style chicken curry is simple, yet satisfying, with roast cumin, onion and tomatoes. To help refresh the palette, there are the ever-popular lassis plus a few more interesting fruit-based concoctions. Reliably tasty food, a bustling atmosphere and BYOB with no corkage explains its continued popularity. 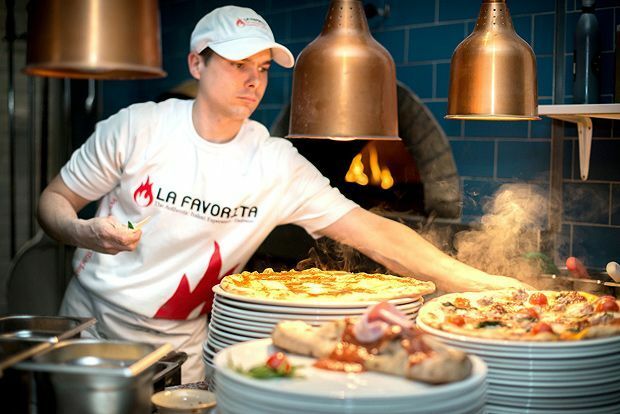 The original Leith Walk pizzeria, La Favorita continues to produce pizzas of great quality with a serving of super-friendly service on the side. Whatever your pizza preference, they're very good, with great bases and gluten-free options too. Most pasta dishes come as starters or mains, plus there are meat and fish mains to be found in among the carbs. The restaurant is especially popular with families: children are welcomed with (literal) open arms and their kids' menu features favourites including smoked salmon pasta with broccoli in a creamy sauce. Billed as a bar and butchery you can perch for cocktails or craft beer in a slick urban bar before heading through to the clamour of the dining room. Having scoured local farms for the best of British, the Chop House is unapologetically meat focused. Custom-built dry-aging fridges displayed behind glass invite you to feast your eyes on great ribs of beef slowly tenderizing over Himalayan salt, while you ponder whether to opt for brown butter hollandaise or bone marrow gravy. Los Cardos (Spanish for 'the thistles') has been a popular Tex-Mex destination on Leith Walk since 2010. Although primarily a takeaway with limited seating space for 10, diners are welcome to enjoy their meals in nearby bars Victoria, Boda and Sofi's. The menu features burritos, fajitas, quesadillas and soft tacos with a choice of steak, chicken, pork, Macsween's haggis and vegetarian fillings. The quesadillas arrive precision engineered, enveloped in melted cheese within a handsomely grilled tortilla. It can be hard to make antipasti seem interesting and original, but Origano manages it. The breads are infused with rosemary and garlic, and there is a wide selection of cured meats, from Parma ham to salami. The pizza here is something of local legend. With three size options to choose from, there's something for every stomach and there's a good range of toppings to boot – everything from your classic Margarita to something a little more special. It just might be the best pizza this side of Leith Walk. This excellent Leith Walk café is shoebox-sized and frills are limited. Breakfasts are recommended, including fabulously salty Turkish spicy sausage (sucuk), salami, eggs, cheese, warm bread, jam and tea, or upsize to the Sultan's Breakfast. Hot mezze platters are a good overview for under a tenner, with squeaky halloumi, courgette, feta and mint fritters and pastrami and mozzarella pastries. Lamb and chicken dominate the mangal (charcoal barbecue) mains and there's tagines for vegetarians. Leave space for sticky baklava and potent coffee. Community enterprise Sikh Sanjog set up Punjabi Junction on Leith Walk to help empower and inspire minority ethnic women in the community. The café offers a short but interesting menu including starters, curries and a thali option, with an emphasis on authenticity and taste. Poppadums are light and crisp, with homemade pickles and chutneys. The methi chicken with fenugreek is a revelation, full of flavor and great value for lunch or an early dinner and there are daily vegetarian specials too. Reliable, high quality, comfortable, welcoming – dining at The Shore feels restorative. If classics appeal, try a pile of mussels in unctuous cream, white wine and garlic or the fork-tender beef carpaccio with parmesan, pickled mushrooms and rocket, drizzled with pistachio & truffle dressing – an absolute stand out. Mad Pie Mondays offer 2-for-1 bubbling fish or venison pies, and haddock and chips come Japanese-style crunchy coated in panko breadcrumbs. Just off Leith Walk's main drag, Stack Dim Sum Bar is an unassuming wee joint, but well worth a detour. Stack offers an array of boldly flavoured steamed or fried dim sum, all cooked to order. The char siu bun is a delightful example of its form, light and pappy on the outside with sweet, melting pork innards. Don't think about giving the sensational chicken claws with black pepper a miss: slow braised to a tender, treacly morsel that's lip-smacking and complex. Evoking the tastes of the best tapas from across Spain. Cuts of pork (from the Iberian black pig) rarely used here, such as presa and the buttery rich secreto, are deftly griddled to retain the full flavour of the meat. Vegetarians won't be disappointed with innovative creations like the popular berenjenas con miel, melting slices of aubergine covered in light batter and drizzled with honey. Portion sizes are large, think raciones rather than traditional tapas. There is an exciting range of Spanish gins alongside the sherrys and Spanish wines. Whoever noted that wonderful things come in small packages must have predicted the success and joyfulness that is the Walnut. Meaty, cold crab claws with vibrant aioli or creamy potato and horseradish soup stand out among the smaller plates. But don't stop there, the big plates are yet to come. Slow-cooked beef short ribs tear away from the bone, while beetroot risotto with gorgonzola and walnut pesto is shockingly seductive. The Walnut's BYOB status benefits from the ample wine/beer selection at Tesco's and Oddbins just across the road.